Caroline Rose black stretch jersey perfect for traveling. Approx. length: 22"L from shoulder to hem; 20"L down center front; 24"L down center back. Round neckline. Full shoulder coverage. Relaxed fit. 4"L side slit; hem hits below hip. Polyester/spandex. Hand wash. Made in USA. 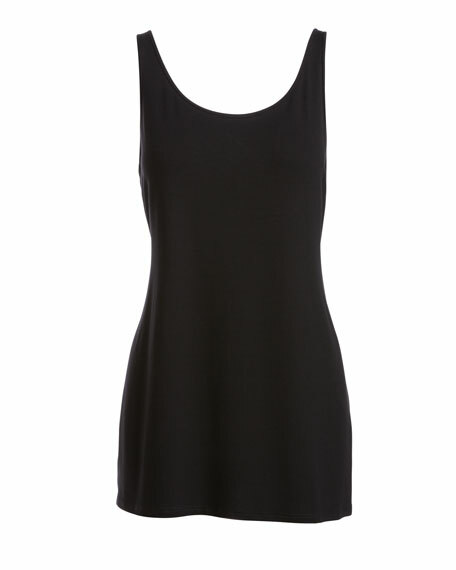 Caroline Rose tank in wrinkle-resistant, stretch-knit jersey. Approx. 29"L down center back. Scoop neckline. Sleeveless; bra-friendly sleeves. Relaxed fit. Side slits for ease over hip. Pullover style. Polyester/spandex; machine washable. Made in USA of imported material. Caroline Rose "Twinkle" lightweight mesh tank with metallic shimmer. Attached cool-knit liner. Scoop neckline. Sleeveless; wide straps Relaxed fit. Side slits. Straight hem. Pullover style. Nylon/metallic. Polyester/spandex, lining. Hand wash. Made in USA of imported material.